When you have two young fur seal pups and their boisterous friends to contend with, sometimes you need a little moment of relaxation. 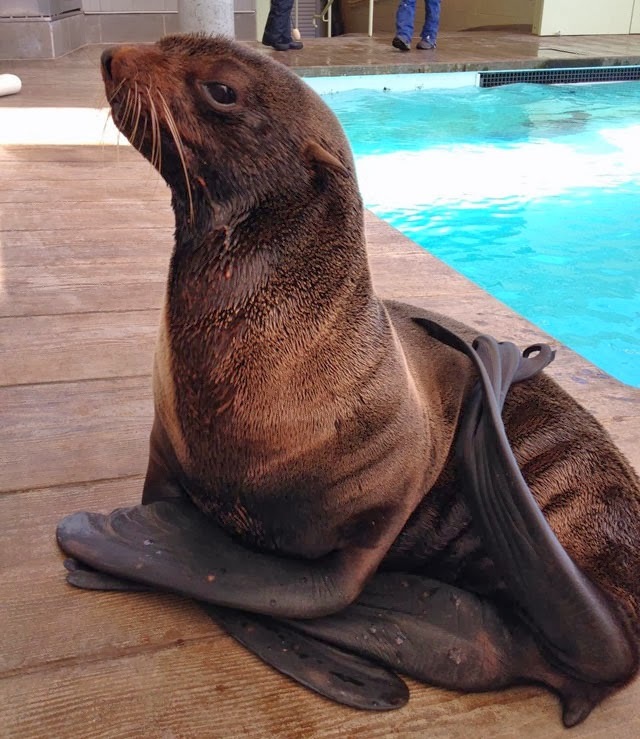 The marine mammal staff caught Ursula in the fur seal's version of the lotus pose this week. She looks quite peaceful, no? This mama is actually grooming her beautiful fur coat in this picture. See how her hind flipper is stretched over her shoulder? She is rubbing her fur with the underside of her flipper. On the top of a Northern fur seal's rear flippers rear flippers are toe nails that are able to dig in and comb the fur or just give a good scratch. Sometimes the fur seals might scratch their backs on a rock or rub their bellies with a front flipper. Whew, grooming is a lot of hard work. As we've mentioned before, fur seals rely on their fur to keep them warm when they're hunting in the cold waters of Northern Pacific Ocean (or spending winters in Boston). They have more hairs in a square inch than 3 or 4 people have on their heads—and we're not talking about your bald uncles, either. 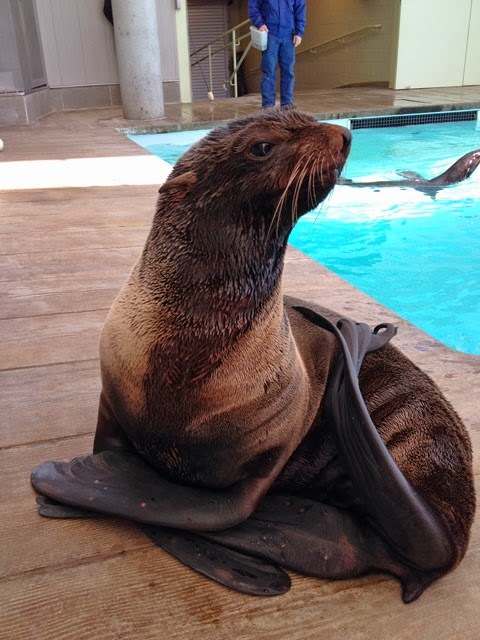 Unlike sea lions or harbor seals that have a cozy layer of blubber, fur seals rely on fur stay warm. Fur seals were commercially hunted for their pelts until the practice was banned in 1966. The population has continued to decline since then. The reasons for the decline in fur seal populations are unclear, but possible factors include overfishing, entanglement in fishing gear, climate change and pollution. The New England Aquarium is one of only a few zoos or aquariums where you can see this beautiful species, and the seals are part of a special breeding program. Both Flaherty and Kitovi were born here! We've also taken in rescued pups—Leu and Chiidax—that were abandoned or injured as youngsters and wouldn't have been able to survive in the wild.